To skip the blather and jump straight to the results, click here. With all votes counted, Andy Dance is the big winner in School Board District 1, and incumbent Trevor Tucker barely survived against Michael McElroy, a big surprise in a race Tucker was confident he could win without much campaigning. Both incumbent county commissioners were in a neck-and-neck race with their Republican primary challengers until later in the evening when Nate McLaughlin pulled ahead of challenger Mark Richter and won by just 235 votes. Frank Meeker barely edged out Dennis McDonald by 208 votes, or 2 percentage points. McElroy at the beginning of the evening was ahead of Tucker by 0.28 percent, but by 7:43 p.m., with more than half the precincts counted, Tucker had pulled ahead by 1 point. McElroy was beating Tucker in such upscale precincts as Grand Haven (where McElroy got 52 percent), but not Flagler Beach, where Tucker got 54 percent. A manual recount may be ahead: on Thursday, the canvassing board will count five provisional ballots that could, depending on the outcome, trigger a manual recount in the Tucker-McElroy race. Janet McDonald finished 24 votes ahead of incumbent John Fischer in the District 2 race, where Lynnette Callender and Toni Baker were eliminated. Fischer and McDonald will face each other in a run-off in November. 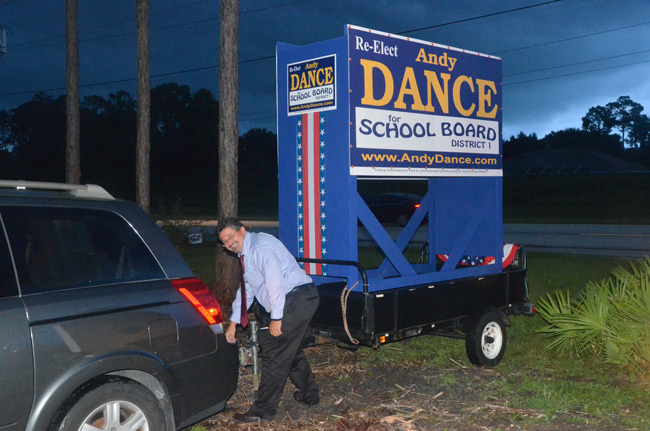 Andy Dance, the school board chairman, was the evening’s biggest winner as he defeated Maria Barbosa with close to a 60 percent total. Dance was celebrating at Woody’s with family, including his mother, who had been a school board member in Flagler from 1984 to 2000. In Palm Coast races, Anne-Marie Shaffer won 41 percent of the vote in District 2, ahead of Heidi Shipley by almost 7 points, with Joel Rosen eliminated. Steven Nobile led District 4 with almost 37 percent of the vote, with Bill Lewis, the incumbent, 8 points behind, and Woody Douge and Norman Weiskopf eliminated. Both city races are headed for a November run-off. The county commission races were deciding only the Republican primary winner. In each case, the winner is facing an independent in the November general. The results were reflective of an electorate heavily weighted by Republican voters, who had more races to vote on than Democrats or independents. The results also show deeply divided local Republicans, with Ronald Reagan Republican Assembly candidates polling well and more traditional Republicans barely hanging on. Richter, both McDonalds, McElroy, Shaffer and Nobile are the Ronald Reagan Assemblies’ candidates. Win or lose, those candidates produced strong showings, albeit showings buoyed by a primary that favored them, as it attracted a disproportionate number of Republicans, and in primaries of late, right-wing Republicans are more likely to vote than moderate Republicans. Nobile had felt confident on his last day of campaigning that he’d be at least in the run-off. He’d hoped for an outright victory, what he termed a “:mandate,” but failing that, he analyzed how he’d take on Lewis. Even before polls closed at 7 p.m., this much was clear about the 2014 primary: turnout was low despite early voting’s surprise showing for Flagler: many of the county’s principal polling sites were seeing anemic activity, and the VFW precinct, the busiest in the county, had seen just 300 voters in early afternoon, against some 7,000 registered in that precinct. Other certainties: Rick Scott, Charlie Crist and George Sheldon won their primaries (Sheldon is the Democratic candidate for attorney general). So did John Thrasher, the incumbent state senator representing District 6, who was running against fellow-Republican Derek Hankerson. Locally, at least two candidates in competitive elections were not breaking a sweat as they campaigned for one last day. One was Trevor Tucker, the incumbent school board member, who barely campaigned and did not find it necessary to stand at any corner today waving a sign, saying it wasn’t going to make a difference. He spoke with the confidence of an assured winner, the sort of candidate who could recline on his west-county roots and assured constituency, against a relative newcomer, Michael McElroy. The other candidate who wasn’t breaking a sweat was Nate McLaughlin, the incumbent Republican representing District 4 on the County Commission. His sweatless feat was more remarkable than Tucker’s. McLaughlin had been under the sun for a while, waving signs and arms vigorously at passers-by at one of the two or three prime locations for politicians on Election Day: in the median at the intersection of Old Kings Road and Palm Coast Parkway. McLaughlin was facing Mark Richter, another newcomer, but whose candidacy was weakened by his own refusal to document boastful claims about his past. But early results were showing McLaughlin’s confidence to have been possibly overstated. Frank Meeker, the incumbent in the other county commission race, was slightly less confident but still predicting a win by a sizable margin over second-time challenger Dennis McDonald, the Ronald Reagan Assemblies candidate just weakened by a different sort of blow: a circuit judge on Monday ruled against McDonald’s case against the City of Palm Coast for the second time. The first time was to declare McDonald’s lawsuit over Palm Coast’s construction around Palm Harbor shopping center groundless (or frivolous, if you prefer). Monday, the judge ruled in favor of Palm Coast’s motion to recoup attorneys’ fees charged up by McDonald’s suit. The actual fee total hasn’t been worked out, but could run up to around $20,000. The Andy-Dance-Maria Barbosa race for school board would have been surprising only if the outcome had not returned Dance to a second full four-year term. But Dance didn’t taking anything for granted, and campaigned for much of the day. The remaining races–for Palm Coast City Council, District 2 of the school board and the three races for circuit judge were not in the predictable category. The election itself appears to have taken place without significant issues, and no law enforcement issues. The numbers, however, are not bearing out the optimism: even for a non-presidential primary, the turnout was close to similar 20-year lows in Flagler. Below, the chart will show the election results as they are produced by the supervisor of elections and the state Division of Elections, and will be updated accordingly. The numbers for the judicial and state senate races reflect multi-county results, not just Flagler County’s numbers, and the numbers for governor and attorney general reflect statewide results. Flagler County’s tallies in those cases will appear in parenthesis. Note: For statewide and multi-county results, as in the races for governor, senate and judicial races, the total tally appears first, followed by the Flagler-only tally in parenthesis. Statewide tallies will not be available until after 8 p.m.
Oh my gawd! What a monstrosity! And it appears that the vulgar crowd, always taken in by appearances, has lived up to its reputation. Tragic. But Machiavelli must be commended and praised for getting it right and still proving it. Recount!! These election results cannot be trusted!! Interesting that so many incumbents got their seats back, in light of all of the “vote them out” rhetoric. Also sad to see that Nobile won, but I’m sure he’ll fit in well with the rest of the detritus that makes up the city council. Expect business as usual in the city of palm coast. There were no decent choices to “vote them out.” I would have loved to but the only option in many cases was a Ronald Reagan Republican windbag with no real solutions. Hopefully we have a good turnout of intelligent voters in November to keep those people out of office. We can expect more of the same sweet deals coming from the County Commission as long as only a tiny percentage of voters in Palm Coast can be bothered to vote. The sad part is they don’t realize they are making the choice for all of us to be stuck with this. Seriously, this is tragic and the consequences are dire. Is it apathy or is it ignorance? Frankly, I don’t know and I don’t care. I think some of it is “none of the above”. Really, in some of those races our choices were between candidates who were all as equally bad as the incumbents. I abstained from voting in several because I could not in good conscience vote for any of the choices. As most of us who live in Palm Coast,these election will not effect our life style as long as we can get our Tee Times, go fishing on our boats, riding my bike, going to the gym,or doing what ever activity we choose .here. Were retired and enjoying it. We don’t need local small town politics to be bothered with. Did I vote ? Don’t know if I fit it into my busy schedule of activities. Really not a priority in my life anymore now that I am retired, and very active. What happened to civic pride and responsibility? Did you leave that where you came from? And in 2016 we again will have the privilege of voting for another Clinton or another Bush. But it’s different, I swear! One is a Strong Woman and the other is the Smart one of the family. Local, State, Federal, your choice will change your life as much as choosing Coke or Pepsi, Chevy or Ford, Big Mac or Whopper, Earnhardt or Gordon. Except in the voting booth one is a Republican and one is a Democrat, so you get to pick between the Evil or Incompetent. Oh Joy! What is it going to take to get people to wake up and vote all of these people out ? We are never going to get anywhere in this world as long as people are too scared to try something new , these people have proven they cannot do the job this county needs but still yet people complain about them and vote for them. Clean house so we can at least stand a chance next time. Unfortunately Seminole Pride’s mindset is what continues to keep incompetents in office. Dance and Meeker and (hopefully not) Fischer and Lewis back into office. Genie I think most of these voters are somewhat in the dark. Or they read the PC Observer who endorsed all of the current office holders. If so then it is ignorance to be influenced by printed media. It’s easy to see why our nation is in trouble. As local elections are disregarded, so are the nationals and we end up with idiots making the decisions for everyone else. Now that we know which candidates in our local races will be in the General election, people can learn about, and pay attention to what their new opponents have to say, what they stand for and think the issues through for themselves before casting their vote. Things can wind up quite differently because in November EVERYONE, no matter what their party affiliation, can vote in ALL the races. So for those who are upset with the Primary results, or didn’t vote at all, the General election is the last chance to decide who winds up in office. Use the opportunity or lose it—- the choice belongs to the voters. Netts gotta go. Hasn’t done anything go!! Luckily no more terms for him.